Marquette opens BIG EAST play on New Year's Day when they host the 13th ranked Villanova Wildcats (12-1). The 25th-ranked Golden Eagles begin conference play with a record of 11-2 and loads of questions about bench strength and a weak defense. 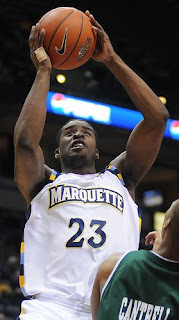 Through the season's first stanza, Wesley Matthews set the pace for Marquette. Matthews' explosive senior season has drawn comparisons to Tony Smith's final campaign in blue and gold, though Matthews' outstanding play might be more laudable given the talented veterans surrounding him. Matthews is fifth in the BIG EAST in scoring at more than 19 points per game and is second in the nation in both free throws attempted and made. The Marquette senior i s shooting a career-best 50% from the field and 84% from the line. With Matthews leading the way, Buzz Williams can count on four consistent contributors every night. Lazar Hayward (17 points, 9 boards), Jerel McNeal (17 points, 5 boards) and Dominic James (11 points, five assists) form one of the BIG EAST's best four-man gangs. Unfortunately for MU, the production usually ends with the Fantastic Four as nobody else on the roster averages more than four points per outing. The Golden Eagles lack of depth heading into conference play might be the single biggest factor in determining whether or not Buzz Williams' first vintage matures into a March surprise. In particular, lack of depth on the baseline is certainly contributing to Marquette's embarrassing team defense this season -- among BIG EAST teams, only Seton Hall and Providence offer a more porous defense than the Golden Eagles so far this season. Despite proclamations by coach Buzz Williams that injured newcomers Joseph Fulce and Chris Otule have been 'pitiful' in their returns, their presence and talent provide hope for a team that has become overly reliant on role players forced into prolonged stints on the floor. Still, despite the optimism of a healthy roster, integrating two newcomers who have yet to practice extensively into a mature rotation will be no small feat. Nevertheless, the BIG EAST will shed no tears for Marquette, and the Villanova Wildcats shape up as a tremendous challenge for the Golden Eagles. The Wildcats head into Milwaukee after blowing out Temple earlier in the week, 62-45. The Wildcats are paced by 6'8" senior Dante Cunningham who leads the team in both scoring and rebounding (17 and 7). Talented guard Scottie Reynolds kicks in 14 points a game, and is knocking down 37% of his three-point attempts. Sophomore guard Corey Stokes has elevated his play this season, averaging better than eleven points per game --nearly double his freshman average. In addition, Stokes is hitting 45% from deep. As with most teams in the BIG EAST, Villanova has played a modest schedule to date falling at Texas last month while beating up on their local neighbors St. Joseph's, Temple, Pennsylvania and LaSalle. Tipoff is scheduled for 1:30pm. The game will be broadcast on ESPN2. Just in case, here's a look back at the pre-season predictions from the Cracked Sidewalks crew.